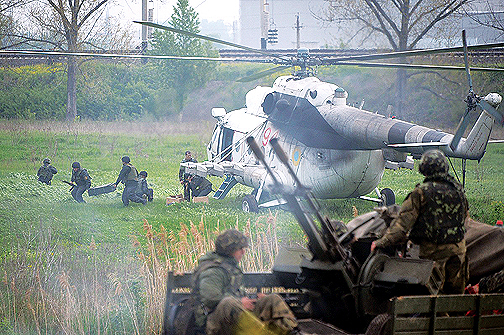 The UN has voiced concerns over the apparent use of UN-marked helicopters by Kiev troops in their military operation against Donetsk regional militia. 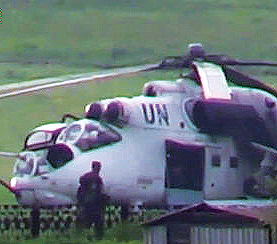 A video of a white-painted Mil Mi-24 strike helicopter with UN logo has emerged. When inquired about the United Nations’ stance on the use of peacekeeper-marked military hardware in non-peacekeeper operations, the office for UN Secretary-General Ban Ki-moon’s spokesperson said such use would violate UN rules. It added that UN-marked aircraft can be used for missions tasked by the UN and that UN’s Departments of Peacekeeping Operations and Field Support is in contact with the Ukrainian authorities to clarify the issue. A video of a UN-marked Mil Mi-24 strike helicopter was published on Tuesday by LifeNews television. It said its correspondents covering Kiev’s military operation in the Donetsk Region took the video near Kramatorsk. LifeNews said at least three combat Mi-24 and one transport Mi-8 helicopters carrying UN colors were spotted in the area. Russia said it “certainly” is interested in finding out more on the situation. “We certainly want to understand how it happened that the UN logo – a UN-painted helicopter – was used against protesters in the east and the south. The United Nations has already expressed it very deep concern,” Russia’s Foreign Minister said in an interview with Bloomberg. The Ukrainian Defense Ministry has denied the claims, saying that no UN-marked helicopters participated in its military operation in the southeast of the country. “The helicopters colored in white paint, which formerly took part in peacekeeping missions, are used. However, they only have emblems on them that confirm they belong to the armed forces of Ukraine,” the ministry’s press-service told Interfax-Ukraine. The Ukrainian military has provided equipment for several UN peacekeeping missions, particularly in the Democratic Republic of Congo.